Macroindentation test: This is the usual method which most of us use. The load applied is larger, typically more than 100N (~1kgf). The usual hardness scales of Rockwell hardness (HR), Brinell hardness (HB) and Vickers hardness (HV) are part of this category. Microindentation test: Tests with lower applied load, typically less than 2N (~200gf), although the range of test load can reach up to 1kgf and still fall within this category. 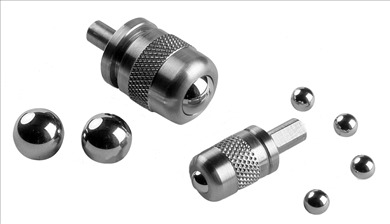 Nanoindentation test: This test is so named because of an even lower applied load, ranging from 1µN to 100mN. At such small loads, the indentation area is only a few square micrometers across, even in nanometer scale, hence the name. There are a variety of hardness scales within macroindentation hardness, each of them different from the other in the employment of different indenter, indenter tip geometry, dimension of indentation geometry being measured and the expected material upon which the method is employed upon. This is a topic which I could share in another article in itself base on what I understand as well as on what I read from different sources. 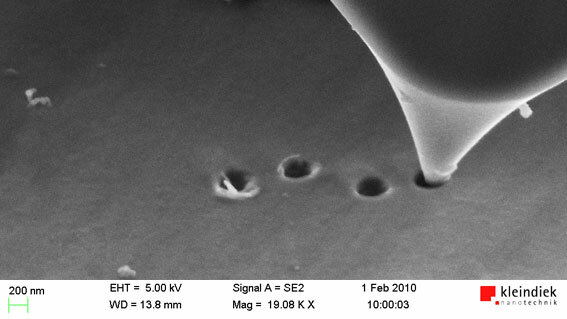 Indentation of a Niobium sample using a silicon tip, viewed under Scanning Electron Microscopy (SEM). Nanoindentation creates very small dent geometry which is invisible to the naked eye (image taken from Kleindiek Nanotecknik). Hardness cannot be considered as a fundamental property. It is an arbitrary quantity which provides a comparative idea of the material’s resistance against plastic deformation against a predetermined scale. As different measurement method provides different scale, the scale themselves have no simple relationship between each other, although comparison charts can be used to convert to an approximate value in another scale for certain materials. These comparison charts are material specific, so a comparison chart for alloy steel may not be useful for aluminum alloy. A comparison graph between Rockwell hardness scale and Vickers hardness scale. No mathematical exact conversion is possible, and conversion between scales are only approximate. Extrapolation is not advised due to this particular reason (image taken from Surface Engineering Forum). Seldom emphasized is the fact that hardness is more dependent on surface property than bulk property. The general idea of indentation hardness testing is to measure material properties, especially tensile strength, in a less destructive manner rather than break apart a sample piece just to measure its property. For quality control, this is a rather important aspect since a quick measurement with a handheld Rockwell hardness tester could determine a batch’s property through a quick and inconspicuous dent on the surface of a few cast ingots. But hardening methods such as precipitation hardening and work hardening, as well as passivating film which formed naturally on the surface of metal, are only superficial. Just because the surface is hard, it does not represent the core of the material bulk to be in the same condition. FE-SEM (Field Emission Scanning Electrion Microscopy) image of a 3-layer passivation film (MgF2/Mg-Zn-F/MgF2) passivation film sputtered on PEN. The overall thickness of the film is only about 200nm. 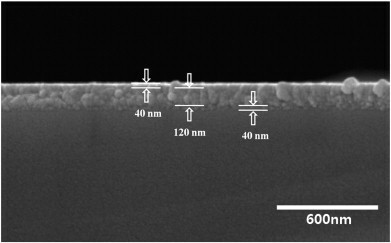 Hardness of such thin material may require the use of nanoindentation hardness testing (image taken from ScienceDirect on the topic of "Evaluation of Thin Film Passivation Using Inorganic Mg-Zn-F Heterointerface for Polymer LED). What indentation hardness could do which a uniaxial tensile test cannot is to determine the said surface property, such as the strength of a coating film or passivating film. The film could be micrometers thick, and cannot be separated from the bulk material in a nondestructive manner and still reveal its mechanical property. It would be important to note that surface finishes will not influence hardness, but may affect the measurement if the indentation geometry is not large compared to the surface roughness. The dimensions of an indentation on a mirror finished surface will prove to be much easier to measure with the indented geometry clearly defined against its surroundings. Finding the edges of the small dent in a rough surface may be akin to finding a needle in a haystack.